New Building has an exciting and challenging task. Through automation and BIM, manufacturers can offer more and more tailor-made products and materials. The (recycled) raw materials of all manufactured elements will be included in a material passport, an important step in the circular economy. Developers of hospitals, offices, houses, schools, stores, bridges and tunnels, and other constructions are faced with stricter environmental regulations through the raw materials agreement and the wish to use circular materials, such as biobased or recycled materials, more often. Reducing the amount of fossil fuels used in production, transport, and use of materials through innovative solutions is increasingly important next to reducing the general amount of materials used. Digital production techniques bring a completely new visual language, and 3D printing, CNC milling, and the use of robots for customised production are even starting to become mainstream. Smart materials that generate energy, are low-maintenance, ensure self-healing and self-cleaning constructions, and are interactive and communicative with built-in sensors; these are all measures to increase the comfort, convenience and safety of the user and their environment. 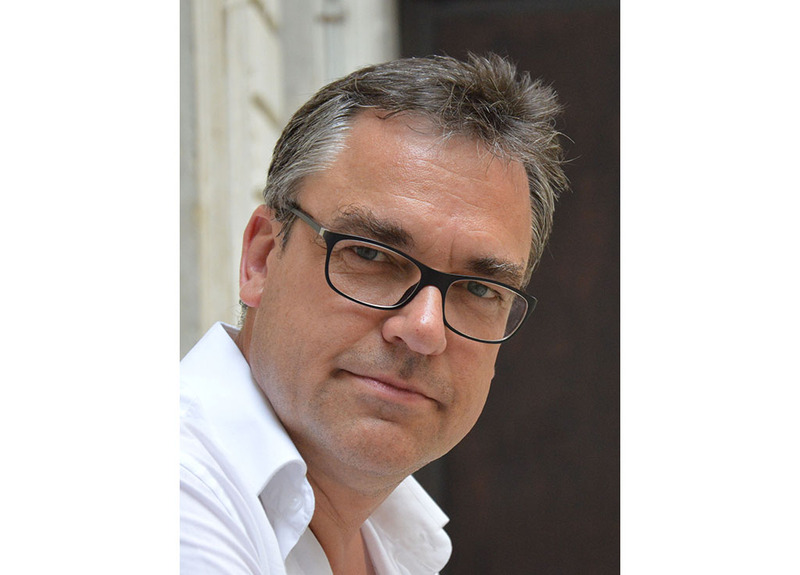 The speaker programme ‘The Future of Architecture’ was put together in collaboration with Ulrich Knaack (Professor Design of Construction at Delft University of Technology). This takes place on Wednesday morning 14 March in the Material Xperience theatre. Speakers are Ulrich Knaack, Lisa Rammig (EOC London), Kasper Guldager Jensen (architect MAA), and Ana Maria Anton (ETH Zurich), among others. 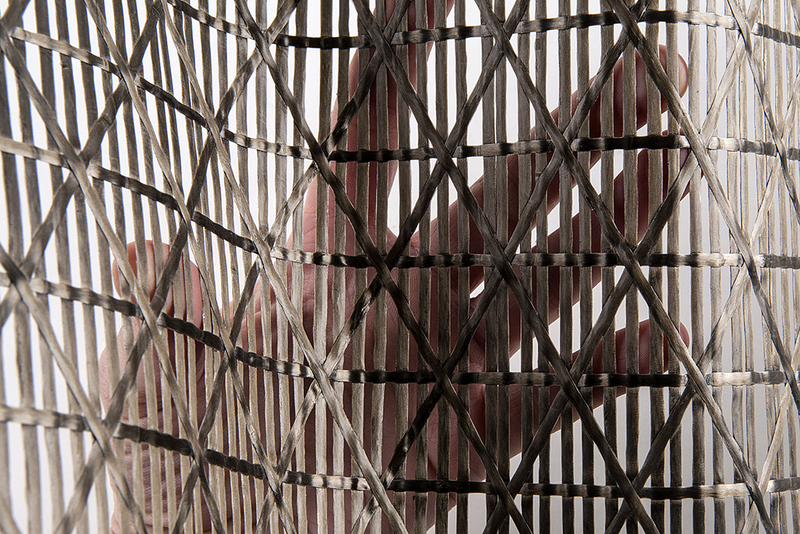 I-MESH is a composite material that filters, balances and diffuses light. The panels are custom-made from yarn made of carbon fibre, fibre glass, Zylon, Technora, and basalt. It is sustainable, recyclable, noise-absorbing, insulating, non-combustible, and it guarantees energy saving. 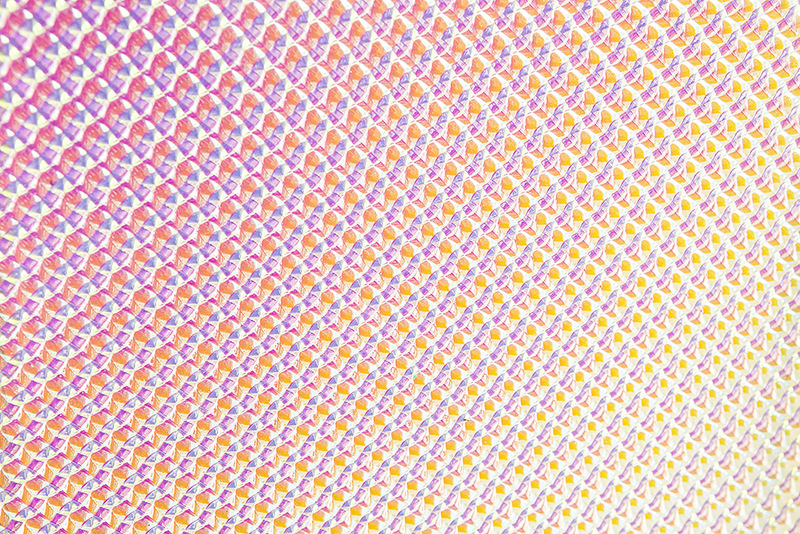 Lumiscopic is a dichroic foil that can be applied to materials such as glass, acrylic or plastic. The colour of the material depends on the viewing angle, varying from warm to cool colours. 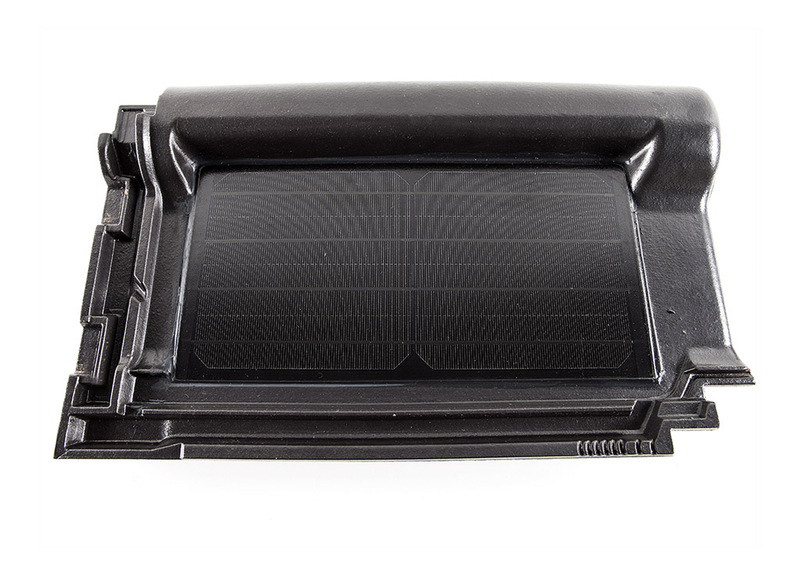 The ZEP solar cell roof tile is a ceramic, traditional-looking roof tile in which a solar collector has been integrated. From a distance you can hardly see the solar cells, giving the roof a ‘normal’ look while still generating green energy. 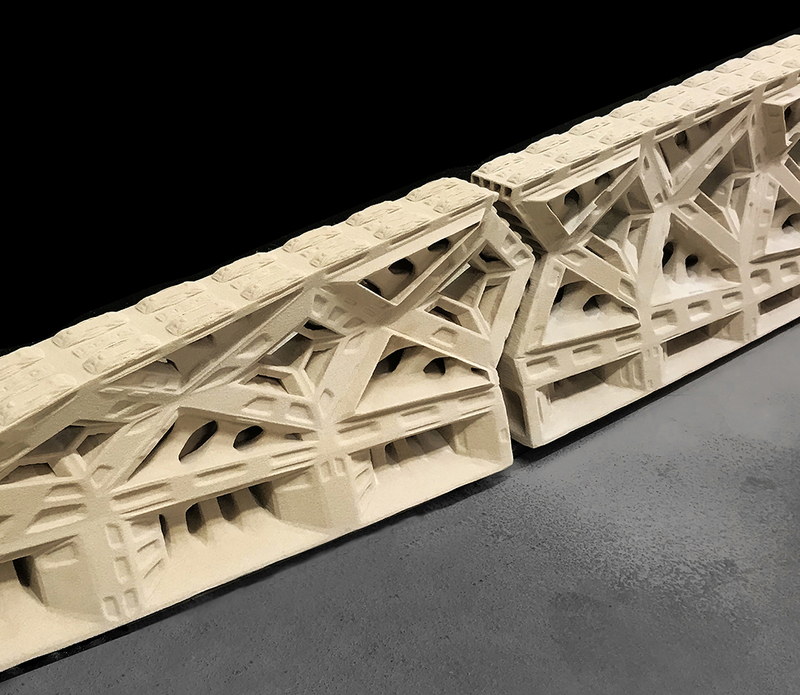 The 3D Printed Reinforced Beam is part of the on-going research of Digital Building Technologies into 3D printed, structural building components at ETH Zurich. Two-sided cantilevering beams, up to 4.5 meters long, are fabricated out of sandstone. Components are 3D printed on a large-scale binder-jetting machine. Through several design iterations joints that interlock the components have been developed, making the beam one structural element. 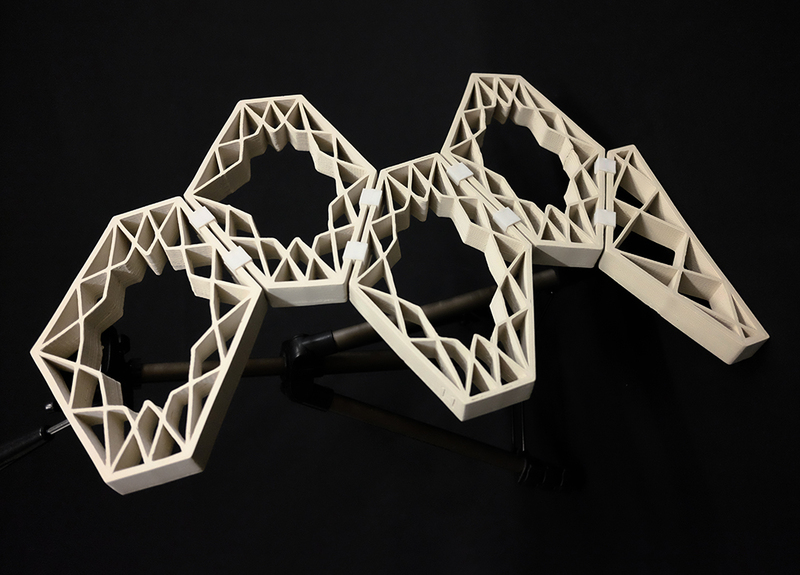 Hexashade, developed by Advanced Ceramics R&D Laboratory, proposes a 3D printed ceramic vault shading system focusing on the design and production of fully customised architectural ceramic components. Entirely conceived in a digital environment, based on the discretisation of vault structures on hexagonal blocks, this system intends to control solar incidence by its adaptive inner structure. Using a computational model and weather data of the place, every block is adapted by its relative position in the set, making it more or less permeable depending on the space/time ratio that needs to be shaded. 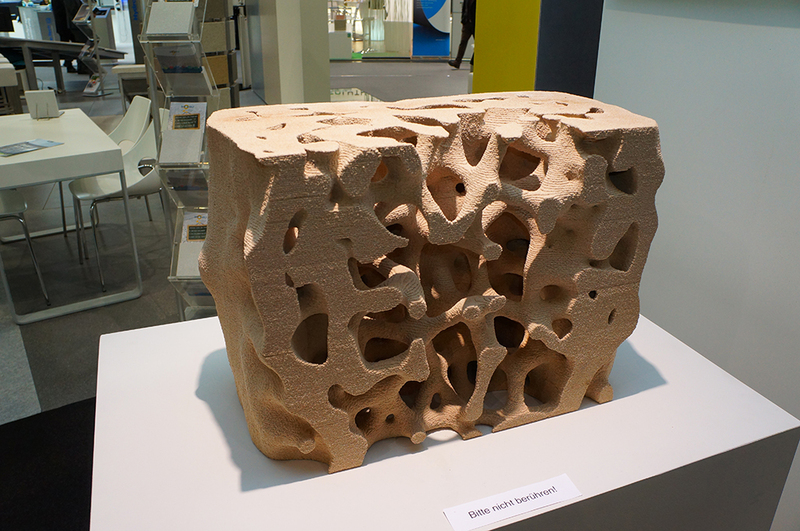 The construction element, designed at the Technical University Munich, was additively manufactured (AM) layer by layer using a selective binding technique, the so-called selective cement activation method. The solid was built by spreading layers of dry particles (a mix of cement and aggregate), which were locally bonded by an aqueous binder. In this case, expanded glass was used as aggregate. This object was produced to demonstrate the high geometric freedom in design and high resolution that can be achieved by this AM method. The dimension of the object is about (L x W x H) 570 mm x 300 mm x 390 mm with a layer height of 2 mm.